Hands are one of the most repeated, symbolic images found in art dating all the way back to the Pre-Historic hand prints found on rock formations. A person's hands give us many clues about the person who owns them. We can estimate their age, their health, the economic status, etc. 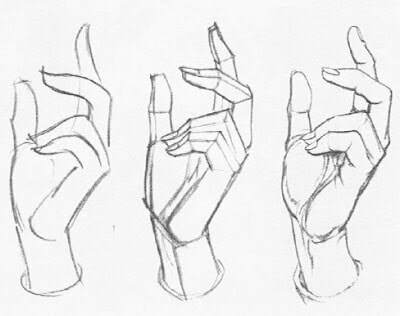 Other than the human face, hands are the most expressive part of the human body. Click on the button below and listen as educator Alice Schwarz ruminates about how one's hands give away information about a person. 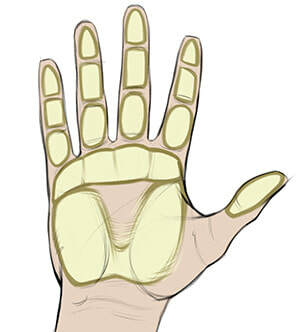 ​The hand will be the central focus of this art project. 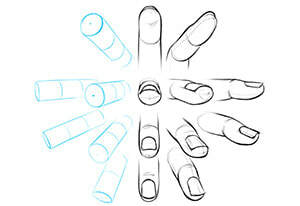 Convey a message or symbolize a specific meaning primarily through a human hand(s). Also remember to include details like veins, bone, muscle, fat pads, wrinkles, knuckles etc. 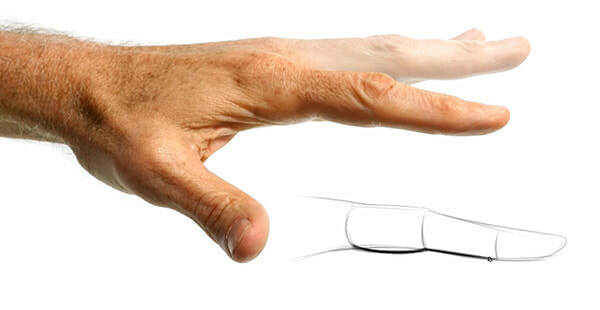 If the hand(s) in your artwork come toward the viewer from the background, you will need to use the perspective technique called Foreshortening. Foreshortening is the illusion that something projects out through space toward the viewer (see the hand in the image to the right). The most difficult objects to foreshorten are those that are long. This can be a tricky technique to master, and even professional artists can struggle to get it right. Often it is your brain that gets in the way sending mixed messages about what you are seeing. For example, looking at the image to the right, we know that a person's head is bigger than their hand. The hand looks larger because things closer to you appear larger than things in the distance. 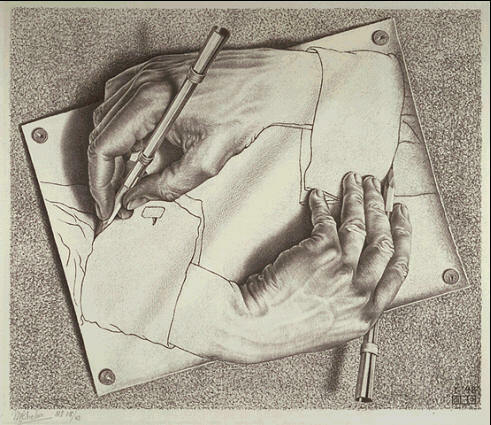 This creates a mental battle as the artist tries to accurately represent what he is seeing. If the arm was more visible, the struggle would intensify because the arm looks short when we know that arms are fairly long. 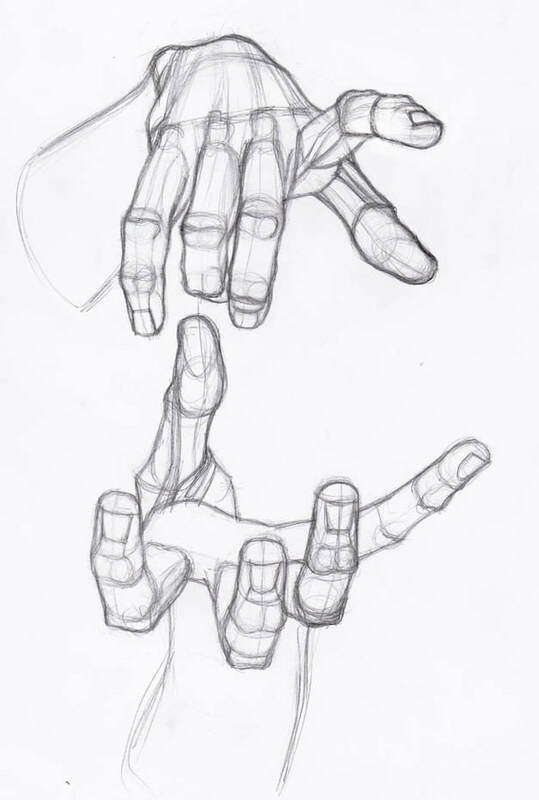 The 2 keys to successful foreshortening are practice and drawing what you see (not what you know).